For all the talk about how much we love the sun, who could turn down a chance to get away from it all under the Treasure Garden 8 x 11 Aluminum Crank Lift Patio Umbrella. 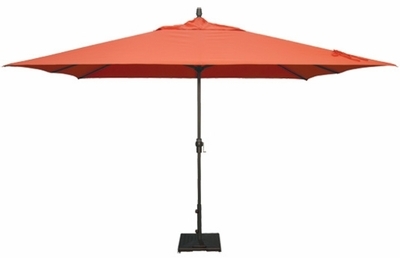 This highly durable umbrella comes with a powder coated aluminum pole that will not rust or corrode in the outdoor elements ensuring its beauty from season to season. The canopy is available in a variety of premium, fade resistant Sunbrella and Obravia fabrics that are sure to compliment any open-air space. A simple hand crank allows you to put your umbrella up and down with ease and the adjustable tilt will make sure that you always have some shade between you and the sun. So add a bit of panache' to your lounge area with this must have accessory that every outdoor patio needs. * Weight: SWV: 28 lbs. * Pole Diameter: 1.5" in. * Bottom Pole: 41" in.